"The Brave and the Bold"
Bravery and boldness are subjective terms. We use them to describe people we wish we could be like -- people who do or say things that we cannot. The idea of what makes someone else brave is intensely rooted in what makes us fearful. To me, a person who jumps out of an airplane to skydive is brave. A person who can walk up to a stranger on the street or in a new job environment and strike up a conversation with them with ease is bold. I would never jump out of an airplane or feel comfortable talking to a stranger about their life. That's because I fear those things. I fear heights and I get self-conscious upon meeting others because I'm constantly internally monologuing (#introvertlife), correcting myself and replaying the last conversation I had. The funny thing is that other people I'm sure, see me as brave and bold because I do things they would never dream of doing. Bravery, according to the definition above, is being "ready to face and endure danger or pain." Boldness, conversely, is "showing an ability to take risks; confident and courageous." 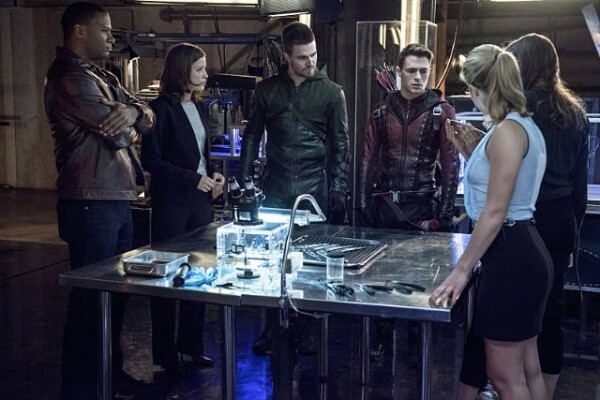 Connie's post about the crossover event between The Flash and Arrow made me aware of the distinct differences between these two terms. We use them so interchangeably sometimes that I think we forget they were intended to define two different groups of people. Okay, class, it's time to think and I will let you pause before I continue: given the definitions above and the title of the Arrow-centric piece of the crossover event, which term do you think defines each superhero? Have you thought about it? Good. Let's discuss! Oliver Queen/The Arrow: brave; Barry Allen/The Flash: bold. Did you get the answer right? It's clear to see from the definitions supplied that Oliver Queen is the epitome of bravery. He's ready to face and endure danger or pain at every turn. As we saw in "Flash vs. Arrow," he is cautious and meticulous whenever he enters the field. That's good and that's smart and it's what has -- as Oliver astutely notes -- kept him alive for eight years. But I think we can all agree that the definition of bravery supplied has a bit of darkness interwoven with it. Boldness, on the other hand, is a more reckless term -- it denotes confidence and courage and I think that's exactly what we saw of Barry Allen during his most recent episode. We saw him express his desire to help others and his exuberance in doing so. We saw Oliver and Barry clash, too, even though their desires didn't. Their motives DID. Because the truth is that brave people and bold people don't often approach the same goal from the same direction. Bold people charge into opportunities; brave people calculate risks. They take deep breaths and think about every possible scenario that could occur. Bold people don't care what others think about them as long as they get the job done. But there is something extremely important that you need to know a bout both brave and bold individuals: they aren't always heroic. In "The Brave and the Bold," there are themes of identity that are explored, but the most important theme is that of humanity. You can be brave and bold and you can be either, but that doesn't mean you are a hero. That is what Oliver's true fear is throughout the episode. He isn't afraid that he is a coward. He isn't afraid that he is a villain, either, necessarily. He is afraid that he isn't a PERSON anymore. But Barry Allen -- bless him -- gives Oliver an important lesson in what makes a person a hero and what makes them a... well, person with a conscious and threads of humanity woven throughout their character. There's something that Oliver tells Barry in "The Brave and the Bold" which really strikes a chord in our fun-loving, fast-running hero: Oliver says that he isn't as emotionally healthy as Barry. And I really think that Oliver is right about that. I love Oliver Queen (if you doubt me, I literally just bought a sweatshirt expressing that fact), but he has a lot of issues. He is a psychiatrist's goldmine -- family issues, post-traumatic stress, emotional and commitment issues, self-loathing, etc. Becca mentioned this in her comment during "Draw Back Your Bow," but too often we romanticize Oliver (or any superhero's) real, damaging issues. Barry, for all of his faults, is able to identify the things within him that are problems. He -- as I noted last night -- still sees the world as a generally good place and he sees people the same way. Oliver calls Barry out on this when they have a confrontation in "The Brave and the Bold": he tells Barry that Central City is full of light and lighthearted jokes. There, the biggest problem that he has is what to name their metahuman. Meanwhile, Oliver snaps, saying that he has seen friends and family die in front of his eyes. And then... Barry throws a roadblock in Oliver's tirade. Barry, too, has seen his own mother die right before his eyes. It startled me, for a moment, because I hadn't made that particular connection between Oliver and Barry. I knew, of course, that both men had watched their mothers die, but the revelation that these men are on equal footing -- that Oliver's pain is not somehow greater than Barry's -- solidified Barry's point. Oliver CHOOSES to confront villains by torturing them and uses his pain as justification for doing so. Barry, however, experienced the same kind of pain to the same degree (watching, utterly helpless to do anything) and yet he does not utilize the extreme and dark tactics that Oliver does. Now, of course, Oliver had five years on an island where he had to learn to be a killer, so their journeys aren't identical... but they're similar enough to remind us that Oliver and Barry have choices. Their fates are not sealed or set in stone. What happened to them -- the traumatic things they have had to endure separately -- affect them, but they do not CREATE them. Choices dictate who or what people become, not circumstances. The problem is that Oliver believes that he is too far gone because his circumstances changed him, MADE him something else (or someone else). There's an absolutely beautiful scene in which Oliver and Barry have a heart-to-heart. Oliver admits that all of his trauma, all of the darkness he has experienced forced him to become someone he didn't recognize anymore. That darkness has chipped away so much at his humanity that there is very little left of Oliver Queen anymore. And that has been the major theme in this season of Arrow: identity. But there is an extra, unexpected layer in this week's episode and that is the theme of humanity. The flashbacks to Hong Kong reveal a younger, more "humane" Oliver who is hesitant to torture a man in order to get information about where bombs are located in the city. Because he cannot torture, the bombs explode and Oliver is left to deal with his guilt and with Amanda Waller. Waller, looking at Oliver, notes that he does have what it takes to torture someone -- he possesses the necessary skills and the promise. But torture is an art form, and one that Oliver had not mastered at the beginning of his Hong Kong journey. When you flash forward a few years, you see what torturing others has done to Oliver's demeanor -- what it has done to his soul. Oliver Queen doesn't believe that he even IS Oliver Queen anymore. When he looks at himself in the mirror, all he sees is a man who hides behind a mask, who pushes the people he loves away, who puts those he cares about in harm's way, who tortures and threatens to kill and is full of anger and bitterness and self-loathing. Oliver doesn't see any piece of him -- or very few, at least -- worth redemption anymore. It's why he spits and spews at Barry earlier in the episode: partially, it is frustration but the larger part of Oliver is jealous of Barry; jealous that he has a promising future, jealous that he lives in a place where sun shines and light exists. Barry still has all of his humanity intact -- he is pure and preserved and that hurts Oliver. It really and truly does. Because he looks at Felicity and loves her so deeply but pushes her away because she doesn't deserve a man who is broken and confused. She deserves everything good and hopeful in life and he wants to give her that. And deep down, Oliver believes that he can never give Felicity what she really deserves. So when Oliver confesses this all to Barry, explaining that his humanity has been sacrificed on the altar of his circumstances and that he is tortured and deserving of a life alone riddled with guilt and self-loathing, Barry completely and utterly empathizes with Oliver. ... Not. In fact, Barry tells Oliver, bluntly: "I think you're full of crap." That delights us and startles Oliver. Barry looks up to Oliver in many ways and idolizes him in many others. Oliver is strong and brave and Oliver is confident and commanding. But during their confrontation, Oliver's tactics startle Barry and I think that is the moment he stops looking at Oliver as a hero and starts looking at him as a friend in need of help. Barry doesn't have a lot to offer Oliver that the man doesn't already possess in spades. But what Barry DOES have is this: honesty. Truths spoken from optimists to pessimists are often difficult to swallow and accept from the latter party, but always -- always -- desperately needed. Because when Barry looks at Oliver, he doesn't see The Arrow. He sees Oliver for who he is -- as someone who is flawed, but still heroic; as a person who is broken but who needs to accept that he is still good. And that is what Barry tells Oliver in their heart-to-heart: he tells him that Oliver's humanity was not stripped away on the island. It wasn't taken from him in Hong Kong. And he wasn't robbed of it when he returned to Starling City. It is, instead, Oliver's humanity that carried him through that darkness. And really, I have to agree. Trajectories of heroes and villains are not all that different, if we look at them laid bare. Heroes are forged from tragedy. Villains are forged from tragedy. Heroes love and lose. Villains love and lose. Heroes isolate themselves. Villains isolate themselves. The difference between a person becoming a hero and a person becoming a villain is that a villain sells every last bit of their soul over to the darkness -- to anger and bitterness and revenge and doesn't look back. By the end of the episode, Barry and Oliver banter back and forth and then... Barry pauses to tell Oliver, honestly, that he inspires people, but not in the way he thinks. You see, Oliver continues to believe that the city -- that Dig, Felicity, Roy, Laurel, Quentin, Thea, etc. -- need The Arrow. He doesn't think they need Oliver Queen, not really. But Barry tells him otherwise. He tells Oliver that people look to him for inspiration -- him as a person, not a hooded and masked figure; him as a PERSON. And that clearly startles and touches Oliver, who has heard those words but never believed them before. In "The Brave and the Bold," humanity is a deeply explored topic. Lyla tells Oliver that "sometimes bravery isn't enough; sometimes the world requires us to be bold." I think that this episode allowed Oliver Queen to explore his humanity -- to understand what it truly means to be OLIVER and not The Arrow. And when he walked away from Captain Boomerang (ha, ha) without killing him, it denoted strength, not weakness. Heroes are forged in raging fire and pain and loss. But humanity is forged in the quiet moments and the honest conversations. Then, the only thing left to do is walk forward toward the light that is already inside of you and keep it burning. Whatever the cost. I didn't get the chance to talk about it above, but there was a great Roy, Cisco, and Diggle scene in the van where the men discuss the craziness of life and the equal insanity of superpowers and metahumans. And while Roy and Dig believe everything to be a bit weird to handle and juggle, it is Cisco who notes that metahumans and powers were meant to be in their lives -- were put there for a reason and a purpose. It was a beautiful moment between the three of them, honestly. MVP of this episode goes to Carlos Valdes because over the past two nights, Cisco Ramon has become the best character. I love his enthusiasm, I love his energy, but I also really loved his heart in this episode. Team Flash recognized that they don't experience nearly as much darkness as Team Arrow does. His heartfelt miniature monologue in the van really sold his character for me -- he needs to become an honorary member of the Arrow cave as soon as possible. And Carlos constantly manages to make Cisco a layered character, rather than a prop for punchlines. For that, he deserves the MVP! I really am going to need The Flash and Arrow to cross over like... all the time. This episode solidified the fact that everyone works together so well and has such great chemistry that it is a necessity that both shows keep putting the casts and characters together. "Are we gonna let this go?" "What do you think?" "We want to see the Arrow cave." "We don't call it that. Ever." "Hey, what's that for?" "... Distracting me from work." Preach, Felicity. The boomerang puns became a bit too heavy-handed in one scene, not gonna lie. "I cannot believe you're a member of the Russian mob." "Former member... probably. We had a falling out." The ladies (Lyla, Felicity, and Caitlin) were attacked by Captain Boomerang at the foundry and all three of them totally proved that they can hold their own: Lyla wielded guns, Felicity found and threw a flash bomb, and Caitlin applied her medical expertise to save Lyla's life. I need all three women to become friends and never stop sharing scenes together. "Who was that hottie?" "Oliver's sister." "My ex-girlfriend." Can we talk about how Caitlin refers to Dig as "Mr. Diggle" always? "You wouldn't have come out a hero, someone who wants to do good, if you didn't have a light inside of you." DIGGLE AND LYLA ARE GETTING MARRIED. AWWWW. Also, Felicity keeping the hood on Cisco's improved Arrow outfit because she knew how much it meant to him? Beautiful. Perfect. "... Not as The Arrow. That guy's a douche." So many of your favourite moments are mine as well. -When Felicity tells Cisco and Caitlin to NEVER call it the Arrow Cave you know Oliver has chastised her for that before, maybe hinting at conversations we haven't seen but enriching their history. "You see what you've done." - You know I am a massive Cisco fan. When he said "I have to see the toys" I just wanted to hug him. - Whenever Diggle or Oliver or anyone talks about their desire to protect the ones they love I am reminded of a line from Farscape where a man says that to the woman he loves. And she reminds him "Ah, but you don't just protect me. We protect each other." Lyla works for ARGUS (which I'm sure causes some ethics conversations in that household) because she wants to protect people, and specifically her family, just as much as Diggle does. She believes that the work she does protects people. And I loved seeing our three amazing ladies in action as well. - Speaking of those ladies, I would love to see Lyla and Felicity's relationship fleshed out a little more (Caitlin too of course but she does live in another city which makes that harder). I was sad when Felicity didn't get to go to the family dinner at the end of ep 7. We haven't seen loads of Lyla/Felicity interaction but I would love it. Pretty please, writers?? I know you don't have a lot of time but pleeeeeease. - Gotta get more Russian mob background. Season 4 anyone? - The little duel between them at the end was so endearing. I know that superhero showdowns are not meant to be cute but that was cute. I have a little boy and that just felt like looking at two little boys playing to see who could beat who. - I like that Oliver admitted he was not emotionally healthy. It looks like you've got to get Oliver pissed off and in an argument to admit truths. And I'm glad the people in his life push him. - I'm glad Roy and Felicity didn't really have much to say when Cisco and Caitlin asked how they handle all the fear and violence. They are all so young and Roy and Felicity didn't have any easy answers to that. - The tone of the Oliver/Felicity moments was very different this episode, a bit more subtle. But you are right. The fact that Felicity comes walking in just as they are talking about preserving the light inside was soooo deliberate. Sara told him to find someone who can harness and encourage his light and the use of that vocabulary again followed by Felicity's entrance is Lit Crit 101! But the biggest thing for me during this episode was how they touched on the very difficult question of torture that is drenched in ethical landmines (pun intended). (Cisco is right, this is the world we live in with or without superpowers.) Was anyone else a little angry with Amanda Waller tonight? I find her to be a fascinating and difficult character. But man was I mad tonight. As soon as she put Oliver in that position in Hong Kong I was fuming. And not because she was making Oliver do bad stuff (although a little of that) but because her argument made NO SENSE. Is she really saying that she, as a higher-up in an international covert organisation, has no access to a more experienced "interrogator" (even herself) when so many lives are on the line? She's going to put that responsibility and weight on someone so totally inexperienced and untested? That's so unprofessional (not to mention terribly manipulative). And then she has the audacity to to say (which I knew she would) that the deaths were on Oliver's head because she threw him in the deep end? Because she could use that guilt to leverage him into what she wanted? No no no no no. That was low and wrong. She is the experienced operative in charge of lots of other experienced operatives. That was on her. Okay, got that out of my system. Gotta go watch the episode again. Would you hate it if I added a couple other things? I love the moment when Diggle says "You really don't care about my marriage." and Oliver replies "Well I would ... if you were married." Subtle. I see what you did there Oliver. Much more subtle than Diggle's approach with you and Felicity in the last ep. Although Oliver doesn't always respond to subtle. But then Diggle goes and shows how an adult gets it done. The woman he loves gets severely injured (much worse than Felicity was injured) but he doesn't push her away. As soon as she wakes up from surgery he asks her to marry him. He acknowledges that he needs her and pulls her closer. Even though they certainly have their share of disagreements and difficulties (like any real relationship) and even though they both work in very dangerous jobs. Boom. Emotional maturity. I love John Diggle. Did you notice how Oliver gives Cisco a little touch on the shoulder at the end of the episode? Seems Oliver has a soft spot for babbling brilliant geeks. Yay. And I'm really done now. 1) The "you see what you've done" was HILARIOUS. Partially because of Oliver's little exasperated finger pointing at her. These two really were quite married in the episode. I like the quiet, inside joke moments between them. 2) CISCO BECAME MY FAVORITE. He was just so utterly delightful and wonderful this entire episode. I want to keep him around forever, please and thank you. 3) ALL THE DIG AND LYLA STUFF. See, Dig is definitely more mature than Oliver is, or at least more in tune with his emotions. I feel like others have said this, but Dig/Lyla is what Oliver believes he cannot have with Felicity but is, in fact, what he COULD have if he only allowed himself to. I love that he got to see Dig face something terrible with Lyla and that he saw how it made their relationship stronger. I think that is so important. 4) I love the female relationships and I really would love more Lyla/Felicity in the future especially since they had a little moment when bb Sara arrived. I hope that the next few episodes bring them all closer together. And I want to keep Caitlin around forever, too. Smart and strong women FTW. That scene with them was epic. 5) Everything about Oliver and Barry's relationship during the crossover was fantastic. We went from seeing them duel to seeing them play together like children do. That end scene was, as you said, just really cute and FUN. Barry brings out something better in Oliver, something he believes he lost. And Oliver reminds Barry that people and things and villains aren't toys or simply fun -- they're dangerous. Ugh, I want their relationship to just continue to grow. 6) The Cisco/Caitlin/Roy/Felicity moment was just so great because you could tell all of them were just at a loss of how to define or compartmentalize what they do, you know? 7) Amanda Waller... eh. I have never liked or trusted her or her methods so I wouldn't have put it past her to try and forge Oliver in the heat of battle. She saw something raw and dangerous in him and trusted him to do a job and he failed. But I do think she's scary -- scary in how risky she is. And scary, you know, in GENERAL. "Ah, but you don't just protect me. We protect each other." Aw, I love this! Same goes for Olicity, of course. She protects him (in different ways), just as much as he protects her. So he needs to get his act together. "I was sad when Felicity didn't get to go to the family dinner at the end of ep 7." ME TOO! I guess in Oliver's presumed absence after the fall finale (I mean, what else could happen? lol), hopefully she and the boys will band together to either find him or maybe mourn him and protect the city in his absence (and Laurel too I guess, from cast set photos....), so she'll bond with all of them during that time. Hopefully we get to see at least some of it. Yeah, Waller is incredibly complicated and in no ways a good guy (though not quite a villain). The way she treats Ollie in the flashbacks totally explains how he deals with her in the present and the tensions they share when together. She is the primary reason Oliver started losing pieces of himself to the Arrow, she trained him in the most soul tearing bits -- he'd killed before, but out of defense and self defense. But this, this is what begins filling his soul with darkness. When he returns to Starling he only has a little bit of light left, but enter Felicity and Diggle and his love for his family and city to help harness it. That light is burning brighter and brighter. "But then Diggle goes and shows how an adult gets it done. The woman he loves gets severely injured (much worse than Felicity was injured) but he doesn't push her away. " ooooh yes, thiiisss. I "how an adult gets it done." I hope there is some acknowledgment of this in the next episode, especially with my theories on Oliver leaving to handle the League but not before his big push to tell Felicity how he feels about her before he goes. Diggle's example might be one of the many things that propel him forward (and then, presumably, when he returns, Felicity will have moved on to Ray for sure, because why would they make it easy for us haha). "Boom. Emotional maturity. I love John Diggle." Yes. You're never done when it comes to Arrow. There's always so much to talk about. I was thinking when Oliver returns it will be less about Ray getting in their way (cause I gotta hope Felicity has learned that he's not really where it's at although the synopsis the CW has released about the Climb mentions Ray trying to make amends to Felicity) but more about some kind of psychological damage that has happened to Oliver while he is away. I mean he has just started maybe believing he has light inside him and if he is around the League of Assassins for awhile that might be damaged. I just feel like they've used Ray as a relationship complication for awhile now and that they might change tactics come the back half of the season and concentrate more on his ATOM persona. But yes, they will not make it easy for us. Cause writers are mean. "I also really loved his heart in this episode." Cisco is Barry's Felicity. The fun one with heart who makes their awful, scary worlds a little better and lighter with love and jokes and enthusiasm. Caitlin is very much Diggle, she gives the deeper advice more often and is stoic, but still loves fiercely. "You wouldn't have come out a hero, someone who wants to do good, if you didn't have a light inside of you." ENTER FELICITY. I know we all tweeted about it, but GUHH. Also, I noted in my recap (http://thenerdsofcolor.org/2014/12/04/noc-recaps-arrow-a-league-of-their-own/) that Felicity was wearing a black shirt with white dots, which is very symbolic for the light trying to break out of Oliver. She rarely wears such dark colors, so it was clearly meant to reflect that moment. And I loved the wardrobe department for it lol. ""With the landmines... it's a long story." #married" They were both definitely thinking about how Oliver landed shirtless and sweatily on Felicity. Their faces say it all! Enjoy your vacation! We'll have plenty to talk about and theorize about when you get back, I'm sure! Next week is gonna destroyyy us! CONNIE. As always, I love your replies. And I do think we are right -- I think what Lyla was trying to say was that Oliver needed someone bold (something he didn't possess) and therefore, needed Barry whether or not he wanted to admit it. That's what I am thinking and sticking with, haha. IT MAKES ME SO EMOTIONAL TO THINK OF HOW MUCH BARRY AND OLIVER HAVE GROWN IN THEIR FRIENDSHIP. I think Oliver was always under the impression that Barry saw him as a hero, but to have Barry admit that he sees him as an inspiration as OLIVER was just so touching. You can tell in the way that Amell played that scene that it meant more to Oliver than anything else Barry had said. Cisco really is the Felicity on The Flash. He's goofy and nerdy and babbles but he sees the world in such an amazing and beautiful way that it's extremely difficult to NOT love him. Caitlin really is the Diggle -- she protects and loves and is also probably the person with the most real life skill (hello, doctor) on the team. WE ALL SAID IT BUT IT BEARS REPEATING: Felicity entering the moment Barry said "light," though. And like, Oliver totally knew it. He completely and utterly knew it. Oh man, that scene though where she recalls the landmines. You can tell she's saying it wistfully and Oliver is like "... wait, wait..." and then he just SMILES A REALLY STUPID SMILE BECAUSE HE REMEMBERS IT TOO AND IT'S LIKE THEIR LITTLE FLIRTY INSIDE JOKE (also aided by the "sweaty" comment Felicity said to Caitlin earlier re: the salmon ladder). Now that you have mentioned the inherent flirting in that whole landmines sequence that is all I can see. Excellent! I live in the UK so I have to wait until the next day to see the eps. It's so hard. Just saw the minute long Climb trailer from the CW and next week looks painful (for many reasons) And then 5 weeks of break. The BBC will have to get me through. They are such little flirty-flirt pants. I cannot even. I'm ready and not ready for it! "Choices dictate who or what people become, not circumstances." - YES! A thousand times yes! Great review and I love wise life lessons mixed in with my super heroes.